How Do I Clean My CERAN Cooktop? A ceramic cooktop can be convenient to clean, because it doesn't have all the nooks and crannies that traditional gas or electric stovetops do. However, that doesn't mean that weird smells and odors don't occur on them. Since ceramic cooktops are more delicate than other types of cooktops, combating this problem requires extra care to avoid damage. If your ceramic cooktop is new, it's possible that it came with a special coating that was applied to protect the cooktop in shipment. The first time you heat the cooktop, this coating may produce a bad, or at least very noticeable, smell. Check the owner's manual to see if it mentions this. If not, call the customer service hotline listed in the manual for more information. If you have had your ceramic cooktop for a long time, it's possible that you may have spilled or dribbled some food onto it while cooking. Food that cakes onto the cooktop can produce odor, particularly if it starts to burn. Protective coatings on cooktops will naturally burn off after the first few times you use the appliance. After that point, you should no longer notice a bad smell. Caked on food can be trickier, since ceramic cooktops can scratch or otherwise be damaged easily. Use a gentle scouring pad, such as a Dobie pad, that features a sponge wrapped in plastic mesh. Unlike steel wool or other abrasive pads, these types of pads scrub grime away without scratching whatever you're cleaning. To make your own, simply slip a normal sponge into a mesh vegetable bag, like the ones frequently used for onions and potatoes. Apply a paste of baking soda and water to the caked-on mess and allow to sit for 20 minutes before scrubbing away. 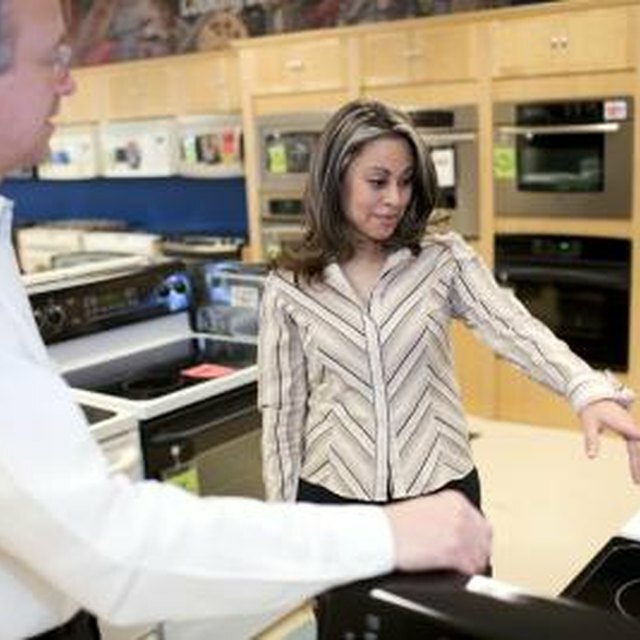 Any coating burn-off smell from a new ceramic cooktop cannot be prevented, as it is a manufacturing issue. If it concerns you, research any ceramic cooktop you wish to buy to see whether or not it has this issue. As for spills, make it a policy to wipe them up as soon as your ceramic cooktop has cooled down enough to touch. Spills are much easier to clean before they have a chance to harden and crust over. If you clean spills up as soon as possible, you reduce the risk of burning the food onto your cooktop. Baking soda is all-natural, safe and emits no harmful fumes. However, you may decide to use other cleaners on your cooktop. Always check safety and warning labels on kitchen cleaners. Some heavy-duty cleaners, such as oven cleaners and degreasers, come with a variety of safety warnings regarding ventilation and application requirements. Some cleaners are also flammable, and may require a thorough rinsing before you use the ceramic cooktop to cook food. Read through all manufacturer instructions thoroughly, so that you do not accidentally create a larger indoor air quality issue in your home than the one you are trying to solve. What Is Cast Aluminum Cookware?